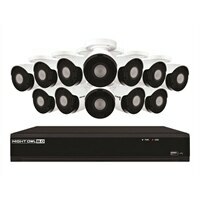 Night Owl IH804-1612BA - NVR + camera(s) Wired - LAN 10/100 - 16 Channels - 1 x 4 TB - 12 Camera(s)Introducing Night Owl's 4K Ultra HD Wired IP Camera Security System with L2 Color Boost Technology and Rapid Image Detection Technology (RID). This expandable IP based video security system is ideal for protecting and monitoring your home or business. The 12 included wired security cameras capture 4K Ultra HD video and audio recorded by a stateof- the-art Network Video Recorder (NVR). The NVR includes 16 Power over Ethernet (PoE) ports that run video, audio, and power using standard Ethernet cables. With H. 265 Advanced Video Compression Technology, 4K data is efficiently compressed for quicker delivery allowing for an enjoyable remote viewing experience. The 4 TB hard drive provides a tremendous amount of local storage, and redundant backup delivers greater reliability. The cameras produce mind-blowing 4K Ultra HD video and continue recording in full color in low-light settings. As light fades, the cameras record in full color utilizing Night Owl's L2 Color Boost Technology, only switching to Night Vision when necessary. Using Rapid Image Detection Technology (RID), these intelligent cameras minimize false alerts by distinguishing true threats from non-threats like rain, wind, and bugs. Whenever real motion events are detected, the system will immediately send push notifications to your Smart Device. With Night Owl's free and exclusive App, you can easily view your cameras from anywhere in the world! Introducing Night Owl's 4K Ultra HD Wired IP Camera Security System with L2 Color Boost Technology and Rapid Image Detection Technology (RID). This expandable IP based video security system is ideal for protecting and monitoring your home or business. The 12 included wired security cameras capture 4K Ultra HD video and audio recorded by a stateof- the-art Network Video Recorder (NVR). The NVR includes 16 Power over Ethernet (PoE) ports that run video, audio, and power using standard Ethernet cables. With H. 265 Advanced Video Compression Technology, 4K data is efficiently compressed for quicker delivery allowing for an enjoyable remote viewing experience. The 4 TB hard drive provides a tremendous amount of local storage, and redundant backup delivers greater reliability. The cameras produce mind-blowing 4K Ultra HD video and continue recording in full color in low-light settings. As light fades, the cameras record in full color utilizing Night Owl's L2 Color Boost Technology, only switching to Night Vision when necessary. Using Rapid Image Detection Technology (RID), these intelligent cameras minimize false alerts by distinguishing true threats from non-threats like rain, wind, and bugs. Whenever real motion events are detected, the system will immediately send push notifications to your Smart Device. With Night Owl's free and exclusive App, you can easily view your cameras from anywhere in the world!